There is much to appreciate in the new film adaptation of Andrew Lloyd Webber's Phantom of the Opera and one glaring defect to regret. However, this "one defect" is so significant that it undermines the entire project. For the most part, the movie is a faithful, if somewhat unimaginative, adaptation of the best (and perhaps the only superlative) example of a "Broadway musical" ever composed. and the dust of the 20th century is blown away. It a magnificent expression of the notion of bringing the past to life--which is significant both for the plot of Phantom, and for establishing the film as part of the aesthetic restoration that is taking place all around us. It is a magical scene--an epiphany, even--and so effective that the movie never again quite manages to equal its power. Generally, the film sticks closely to the script of the musical--which is fortunate, since the scenes that do deviate from the source material fail abysmally. The Phantom's "origin scene" is disappointingly prosaic, the swordfight is inappropriate, and the decision to convert recitative lines into spoken dialogue is a singular mistake, as the spoken lines intrude into the living flow of the music. On the other hand, some cinematic touches are quite inspired, such as the animated wall-mounted candelabra in the Phantom's lair, which are a wonderful homage to Jean Cocteau's silver-screen classic, La Belle et la Bete. And the Don Juan Triumphant sequences are more compelling in this film adaptation than in any stage production of the musical, since the intimacy of these scenes is better communicated in film than on stage. 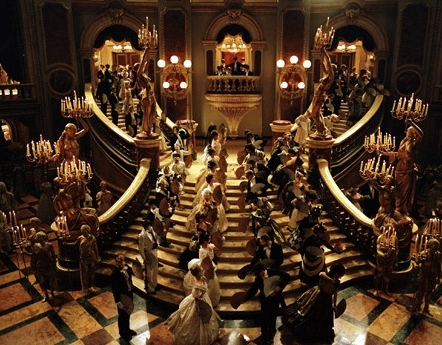 The set design and costumes are magnificent and do justice to the sumptuousness of the era. Paris in the "Second Empire" of Napoleon III was a world of full-blown opulence and splendour, and the film luxuriates in the ornateness of the period. 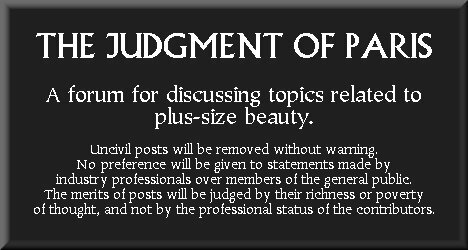 The setting, of course, closely approximates the Grand Opera House in Paris (also called the Palais Garnier)--a grand edifice which came up as a topic of discussion on this forum a few months ago, in a post about ideal settings for plus-size model shoots. But by now, you have probably guessed what the fundamental defect in the movie is--and it is rather an ironic defect, since The Phantom is, on one level, a tale about an aficionado of the arts who is simply trying to persuade the art establishment of his day to make better casting choices. What in the world is a malnourished waif doing in a setting like this? Emmy Rossum, who is 18 but looks 12, is not even attractive for an underweight talent. Sarah Brightman--the enchanting soprano who created the role of Christine Daae in the original stage production--was never full-figured, but at least she possessed the soft, rounded facial features that gave her the "angelic" look which the part requires. But Rossum has such hard, modern features that she completely breaks the spell of the film every time she appears onscreen. And what makes her presence all the more jarring is the fact that her outfits are true to the period--i.e., they are cut in a feminine manner, and therefore require the presence of a voluptuous figure to fill them out properly. Since Miss Rossum has no such figure, these costumes simply emphasize her deficiencies. 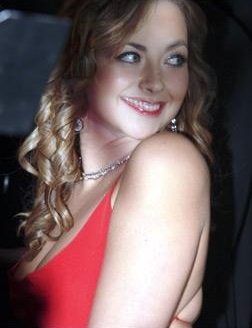 This miscasting is doubly regrettable because (as readers of this forum will recall) shapely English soprano Charlotte Church was initially slated for the role of Christine Daae, but (incomprehensibly) was told that she could only get the part if she lost weight for it--which she rightly and admirably refused to do. She looks stunning--not genuinely plus-size, perhaps, but wonderfully soft and curvaceous--and much, much closer to the 19th-century ideal of opulent beauty than the skeletal Rossum. This is the image of an "angel of music" who could actually inspire a creative artist to compose an opera in her honour. The malnourished apparition who inhabits the current Phantom film could inspire no one--except, of course, the curve-o-phobic entertainment reporters who have enshrined the underweight standard in the first pace. 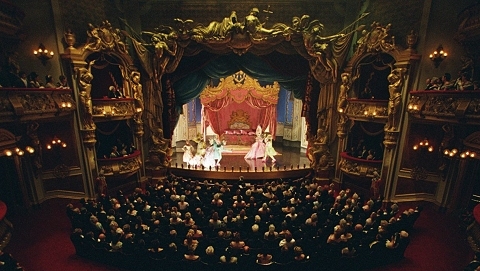 Untimately, The Phantom of the Opera is worth viewing simply for the opportunity to soak in the splendour of its 19th-century aesthetic. But precisely because the film revives that aesthetic so faithfully, the filmmakers' decision to insert a modern waif into the production is that much more regrettable. What a shame that the movie itself had no "behind-the-scenes" Phantom persuading the filmmakers to select a more fitting female lead. 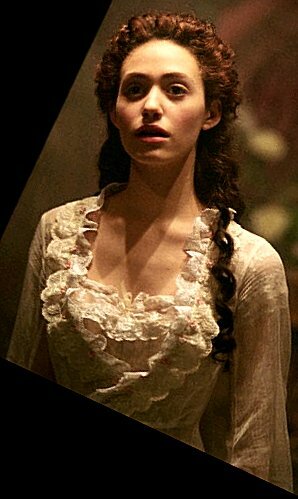 Incidentally, anyone who tires of the tinny voices in the film and wishes to hear The Phantom of the Opera sung properly is directed to the recording linked below, which features Colm Wilkinson (Webber's initial choice for the Phantom) and operatically-trained soprano Rebecca Caine as Christine. It is a "highlights" version, but it captures all of the musical's greatest songs and dramatic moments on one disc. Furthermore, several months ago, Jerry Dawes--an occasional contributor to this forum--sent us the following image, for which he spliced a famous picture of Valerie Lefkowitz into our own photograph of the Grand Escalier in the Paris Opera. We declined to post it at the time, because the scale is all wrong (Valerie is far too "tall" in the image, as the stairway is a towering inner space that reaches far upwards and dwarfs anyone who stands before it). But considering the topic of this post, we thought that this would be a good occasion to share it.